Home > Blog > News & Events > 2017 Press Releases > 3 million registered users on the TraceParts CAD content platform! Saint-Romain, France, 18 October 2017 – TraceParts, one of the world’s leading providers of 3D-marketing solutions, announces strong growth in the number of users registered on its online CAD-content platform. The TraceParts CAD content platform was launched in July 2001 and has constantly grown in popularity since its release. In January 2011, the platform had 1 million registered users. 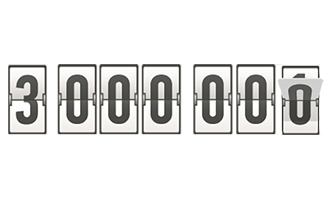 Three years later, in December 2014, the two million mark was reached. Today, the platform has reached a new milestone with 3 million registered users, representing 1 million additional users in less than three years! The platform’s success is due to the fact new product ranges are added to the TraceParts library on a daily basis, meaning engineers and design professionals have access to a vast selection of standard components, all instantly available with full technical specifications and 3D models. Moreover, the CAD models can be downloaded in all major native and neutral formats, which facilitates the design process for users. says Bertrand Cressent, Product Manager at TraceParts.